Apple is developing L-shaped batteries to power two new OLED iPhone models set to debut next fall, according to KGI analyst Ming-Chi Kuo, who notes all three handsets expected to launch next year will boast increased energy capacities. In a note to investors seen by AppleInsider, Kuo said he believes Apple is working with Korean company LGC on the supposed L-shaped battery design. As smartphones decrease in size, manufacturers are becoming increasingly hard pressed to find space to pack in operational components. Batteries, typically one of the largest parts in a given handset build, are particularly troublesome as technological constraints limit their design to symmetrical shapes like rectangles. To pack in as much energy density as possible into iPhone X, Apple decided to build in two battery cells that roughly form an "L" shape in the phone's glass chassis. Rumors leading up to the phone's release claimed the company would employ a single-cell L-shaped battery, but the technology was apparently not ready in time. If Apple and LGC work out manufacturing hurdles in time for mass production, the next-generation 5.8-inch OLED iPhone will be powered by a 2,900- to 3,000-mAh battery, Kuo says. A larger 6.5-inch OLED model is anticipated to employ a two-cell design with a capacity between 3,300 and 3,400 mAh. By comparison, the dual-cell unit in iPhone X is rated at 2,716 mAh. To keep costs down, Kuo expects Apple to stick with a rectangular battery design for the rumored 6.1-inch LCD iPhone set to debut alongside the flagship handsets next year. 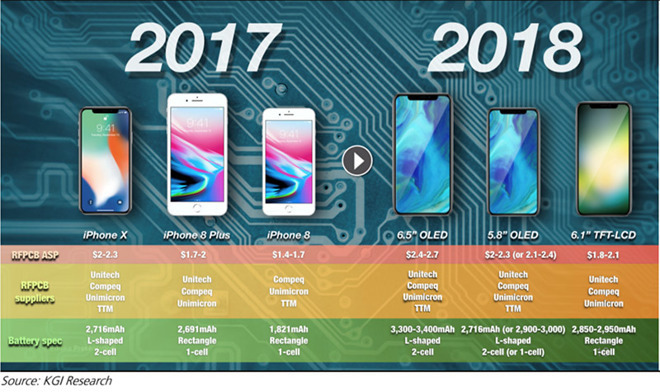 Like the OLED models, however, the LCD version is predicted to boast a power-hungry TrueDepth camera and will therefore receive a boost in battery capacity compared to this year's iPhone 8 series. Apple's new battery design is expected to increase the going rate of rigid-flex printed circuit boards (RFPCB) to increase 40 to 50 percent year-over-year. Larger battery capacities require an increased battery cell area, which in turn necessitates a larger FPCB. Additionally, the L-shaped design is more complicated to manufacture than traditional shapes, and are thus more expensive to manufacture, Kuo says. The analyst predicts Apple to ramp up shipments of its 2018 iPhone lineup earlier than it did this year's models, meaning RFPCB production for said devices will likewise jump 20 to 30 percent year-over-year. All current iPhone battery suppliers, including Unitech, Compeq and Unimicron, will benefit from the ASP increase. Kuo expects Apple to release a trio of iPhones in 2018, including two OLED models and a budget LCD variant. Alongside a next-generation 5.8-inch iPhone X model, Apple is rumored to release a plus-sized handset with a massive 6.5-inch OLED screen. As for the LCD version, rumblings earlier this week suggest Apple might return to a metal case design in order to cut down on costs.